Evolution of a Foodie: Julep 100 Degrees of Mystery Box Now Available! Julep 100 Degrees of Mystery Box Now Available! A new Julep mystery box just went live, the 100 Degrees of Mystery Box! It's $24.99 and has a $100+ value. 100 of these boxes will also contain a collection of must-have products and a $100 gift card! There's only one mystery box which is much different from what Julep usually does with three or more boxes. Small and Major Add Ons are available at check out as well. $9.99 for the small ($42 value), and $14.99 for the large ($49 value). 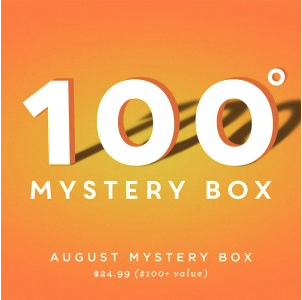 What do you think of the 100 Degrees of Mystery Box? Are you getting one? Let me know in the comments! I did go ahead and order this one. I'll send you spoilers once I get it. Excited and hoping I don't get a lot of dupes. It's been a while since I ordered one from them, but the value seemed pretty good this time. It wasn't. :( Got box #1 yesterday. Not good colors for me, but I do love Max. Oh well. :( Max is a great polish, so versatile.